Nina’s distinctive style left its imprint on every form of music she touched, causing some jazz reviewers to put her in a category all by herself. Not confining herself to jazz and blues, she also left her mark in spirituals and Gospel singing, eventually becoming one of the most powerful symbols of the civil rights movement in the America of the 1960s. She was born Eunice Waymon in 1933 in North Carolina. Already at the age of seven she was playing the organ in a local church, later moving to New York to study classical piano in New York at the Juilliard School of Music, a rare opportunity for a black woman in the 1950s. As a singer her low-key interpretation of the blues quickly brought her to the public eye. 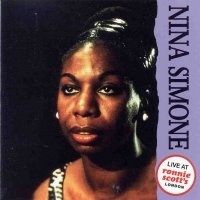 Accompanying herself on piano, she changed her name to Nina Simone and enjoyed some prominence for a time. It was her version of the Gus Kahn/Walter Donaldson number My Baby Just Cares For Me that brought her biggest commercial success, followed by a recording of Gershwin’s I Loves You Porgy that was to become one of her biggest hits. Later on, in 1987, a re-released My Baby Just Cares For Me endeared her to a whole new generation of fans, and the song was used for a while in a Chanel advertisement. In 1969 her song To Be Young, Gifted and Black made her a role model for Afro-American women and became an anthem for the movement to end segregation in the United States. The jazz singer Dee Dee Bridgewater later declared, "I would say the person who influenced me most as a young black girl was Nina Simone because she was so outspoken." Nina's repertoire embraced works as diverse as those of Bob Dylan and the Bee Gees. Her range of styles in over 50 albums included classical, gospel, folk, pop, opera, and rock. She was consistently revered and imitated by other singers. In 1974, after becoming disenchanted with life in the United States, she moved to Barbados for a while before settling in the south of France. In an interview in 1998 she said that her protest songs had been her personal attempt to defend the rights of American blacks. That same year she was a special guest at Nelson Mandela's 80th birthday party. Nina blamed racism in the United States for her decision to live abroad, saying that racial inequality in the US, even then, was "worse than ever". Nina was twice married and divorced, and is survived by her daughter, Lisa.